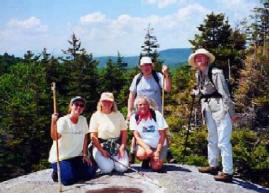 Hike in Vermont's Northeast Kingdom Region of mountains, lakes and small villages. Coined by former Vermont Governor and U.S. Senator George Aiken, the "Northeast Kingdom" sprawls across the vast, sparsely settled northeast section of the state. Lakes and mountains abound, and bucolic, unspoiled country roads connect the small villages that make up this region. Moose, and even bear sightings, are not uncommon occurrences. We hike up Mt. Pisgah with awesome views of fiord-like Lake Willoughby below, climb Bald or Wheeler Mountain with it's sweeping vistas of the entire area, walk on country roads through the picturesque towns of Craftsbury Common and Brownington, go to the top of Burke Mountain for panoramic vistas of Vermont and New Hampshire, see waterfalls, and visit country stores, like Willey's, in Greensboro, where "If they don't have it, you don't need it!". This is the start of peak foliage time in the "Kingdom" and the hiking is at it's best. We stay at comfortable inns in East Burke and Greensboro, VT, and share great gourmet and country cooking at the inns and restaurants nearby.